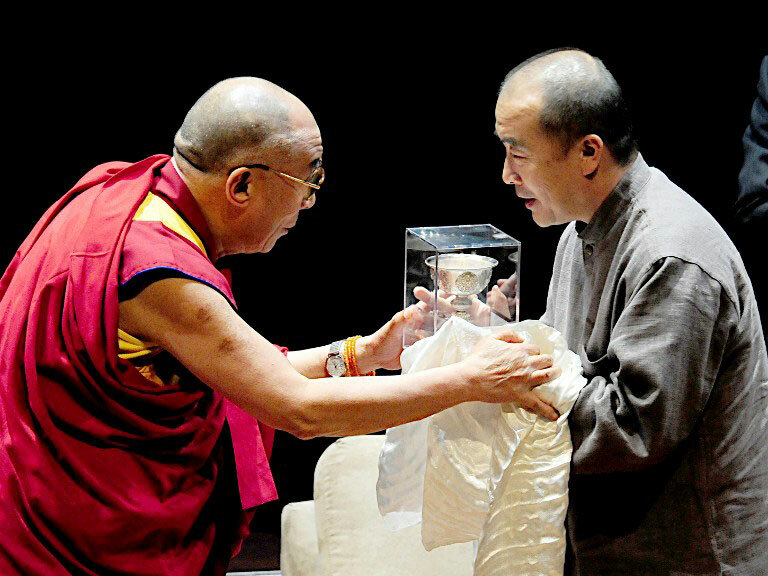 The Dalai Lama presents the Light of Truth Award to novelist Wang Lixiong, who helped spearhead a petition by prominent Chinese who questioned Beijing's 2008 crackdown on protests in Tibet, in a 2009 photo. Authorities in the Chinese capital have barred dissident writer and historian Wang Lixiong from leaving the country, citing concerns that his exit would "damage national security." Wang, 62, was prevented from boarding a plane for Japan by border guards at Beijing's Capital International Airport on Saturday, he confirmed on Tuesday. "This has all been in the media so I won't say much more," Wang told RFA. "But yes, that's the way it is." Wang confirmed he had planned to travel to Tokyo last Saturday, but had been told he couldn't leave the country because he might "endanger national security." "They always say that," he said. "It's a catch-all expression." But he declined to comment further, saying that he had "made a promise" not to speak to the press. Wang, who closely follows Uyghur and Tibetan issues, has been openly critical of Beijing's policies in those regions. He once described jailed Uyghur scholar Ilham Tohti as the Uyghur equivalent of late South African freedom-fighter-turned-president Nelson Mandela. In January 1999, Wang was formally arrested on suspicion of "leaking state secrets" and held for 42 days before being released after he carried out research for an article on Beijing's policies in Xinjiang. He was also held under house arrest in July 2014 along with his wife Tsering Woeser during a visit to Beijing by U.S. Secretary of State John Kerry. Woeser is already unable to travel, having had a passport application turned down by the authorities. Beijing-based rights activist Hu Jia said this was the first time the travel ban had been extended to Wang. "Wang Lixiong has always been free to travel in the past, but now the travel ban has been extended to him, too," said Hu, who saw the couple as recently as last week. "Now, one of them has no passport at all, while the other isn't allowed to leave the country," he said, adding that there is a huge difference in the way they are treated by the authorities, suggesting that Woeser is more harshly treated because she is Tibetan. "Actually Wang was saying that he is sometimes stopped and sometimes allowed to leave," Hu said. "But it seems that they are targeting him somewhat deliberately this year." He said the number of people currently prevented from leaving China is growing fast, and the measure is now being extended to all kinds of people who were previously allowed to move freely. Dozens of human rights lawyers and their family members, including teenagers seeking permission to study overseas, have been prevented from leaving China since a crackdown on the profession began in July. Now, the practice is apparently being extended to activists and critics of the regime, Hu said. Wang has written several works on Tibetan issues, including the Sky Burial: The Fate of Tibet, and has also spoken out about the large-scale losses to Tibetan culture during the state-sponsored destruction of the Cultural Revolution. In a recent commentary broadcast on RFA's Mandarin Service, he detailed the ruling Chinese Communist Party's mass killing of Tibetan rebels following the arrival of the People's Liberation Army (PLA) in the region in 1950 and the policies of "class struggle" that divided Tibetan society against itself. Wang is best-known for his 1991 apocalyptic political parable "Yellow Peril" which prophesies a China embroiled in political, economic, cultural, demographic, and ecological crisis and the country's collapse. The novel and his nine other books are banned in mainland China. Wang had planned to travel to Japan to promote the book's Japanese-language translation, before heading to Taiwan to witness the forthcoming presidential elections, Japan's Kyodo News reported. It said Wang's writings on democracy, Tibet, and the Uyghur ethnic group of Xinjiang "are well received in Hong Kong, Taiwan, and foreign countries." The CCP clearly fears the truth. That is why the banned Woeser from traveling outside China & now banning her husband, Wang Lixiong. That is also why China bans Western journalists from investigating human rights in Tibetan areas without specific permission from the Party.